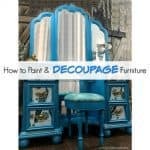 A painted china cabinet with fabric decoupage is the perfect addition to my new living room. 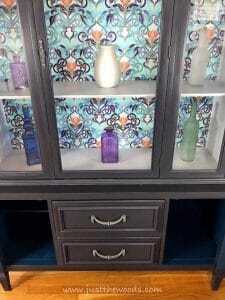 As soon as I got this vintage china cabinet I knew that I wanted it for myself. 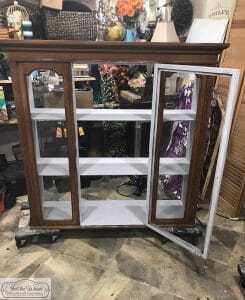 We have a bookcase in the living room that I intended to replace with this piece and fill with books. I love the look of a painted china cabinet filled with books. No one says you have to keep china inside. The before and after of this transformation gets me every time. 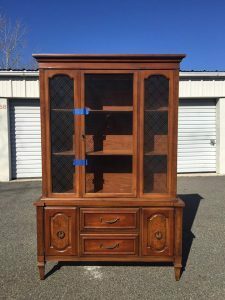 This china cabinet is vintage, in great shape with fixed shelves and dovetail drawers. It also had this neat metal webbing of sorts over the side glass panels. And it also separates into two pieces which makes it much easier to get into my shop to work on. 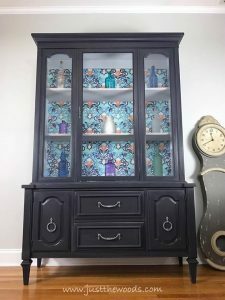 Disclosure: This painted china cabinet post contains sponsored links from Spoonflower and affiliate links for your convenience. Click here for my full disclosure policy. We have been redesigning our entire living room. We’ve removed all of the old furniture, painted the walls and this piece will be a new addition to the room. We had the old layout for 7 years and were in desperate need of a change. 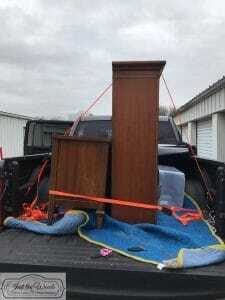 When we went to pick up the china cabinet from storage, where it had been patiently waiting for its makeover I had hubby help me. I admit that I was a bit uneasy with hubby’s “babe its fiiiiine, don’t worry” as we loaded it in the truck. I’m the type that likes everything tied down tight, where he prefers to ‘wing it’. Can you see why I was concerned? Thankfully we made it back without incident and I could get started! 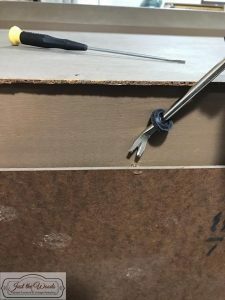 The first thing I did was pop off that backing for easier access to the inside of the cabinet. My tack puller and teeny tiny flat head screwdriver work best for this. 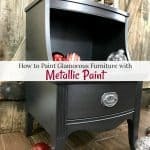 The entire piece was then prepped for paint, this is my process for How to Prep Painted Furniture. 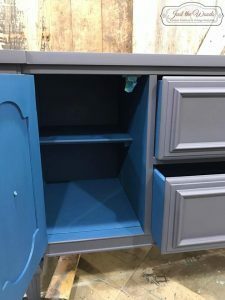 Once the back was removed I was able to get easy access to the inside of the cabinet which was painted in Tahoe which is a very light gray. 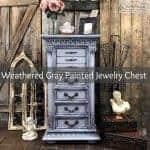 This color has been quite popular lately, I recently completed a custom desk in this color, you can see the desk by clicking here: Gray Painted Desk. Wait, rewind. Before I could paint, I had to remove those metal pieces that covered the glass. They are really cool, but I don’t think they will work with the end result that I have planned. 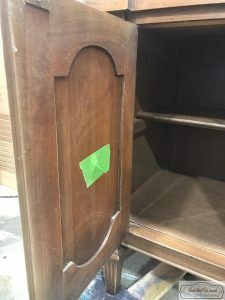 I also had a loose piece near the top of the china cabinet that needed to be secured. 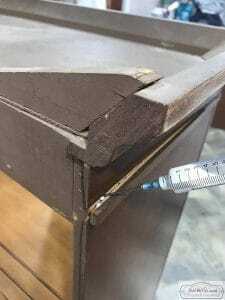 But since it was a tight space I used my wood glue syringe to get just enough wood glue in the area without making a mess. 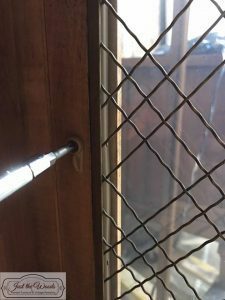 The hardware was removed and a long screw was placed in the hole and taped to make sure that even when closed I can still get the doors opened when needed. 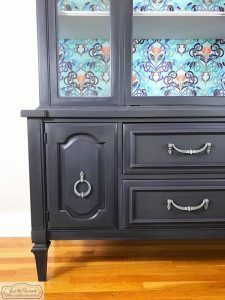 I decided to use up the leftover charcoal paint that I had from a previous custom painted china cabinet. 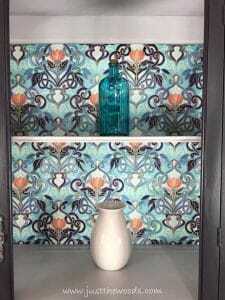 You can check that makeover – Vintage China Cabinet if you’d like. 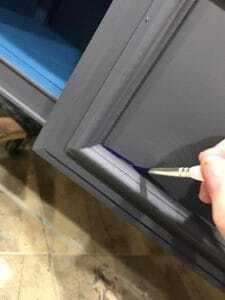 The color was a mix of gray and black, but I didn’t want a straight charcoal so I also added some navy blue as well as cranberry to give the color a subtle purple undertone. 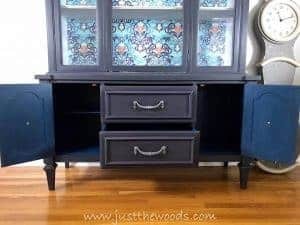 I also decided to paint the inside of the drawers as well as the side cabinets in a pretty blue. 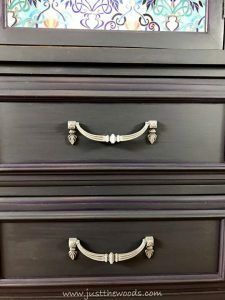 The gray was missing that little something extra, so I then added a purple glaze to the crevices using a small artist brush. The original hardware was removed, cleaned and painted gray and then metallic silver. The hardware itself was and still is perfect for the piece. 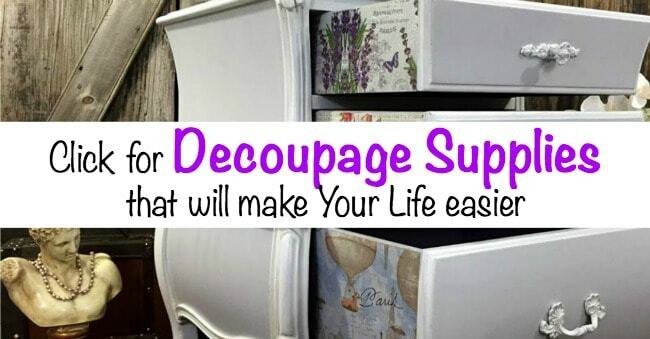 You can see my process of cleaning and painting hardware How to Prep, Clean & Paint Hardware. I was able to remove the center glass panel from the door, but I was unable to remove the glass from the side panels. Normally I use frog tape to cover the glass, but this time I was a bit lazy and painted the edges all willy nilly and got paint on the glass. 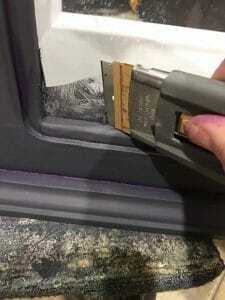 So I had to break out my flat razor to remove the paint from the glass. This worked like a charm! 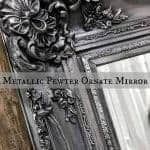 Click here for more methods to paint mirrors or glass: How to Paint a Mirror Frame (or Glass) the Easy Way. There will be no books in here, sorry kids. 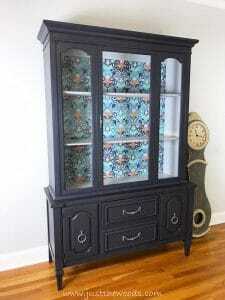 This painted china cabinet is too pretty to fill with books. 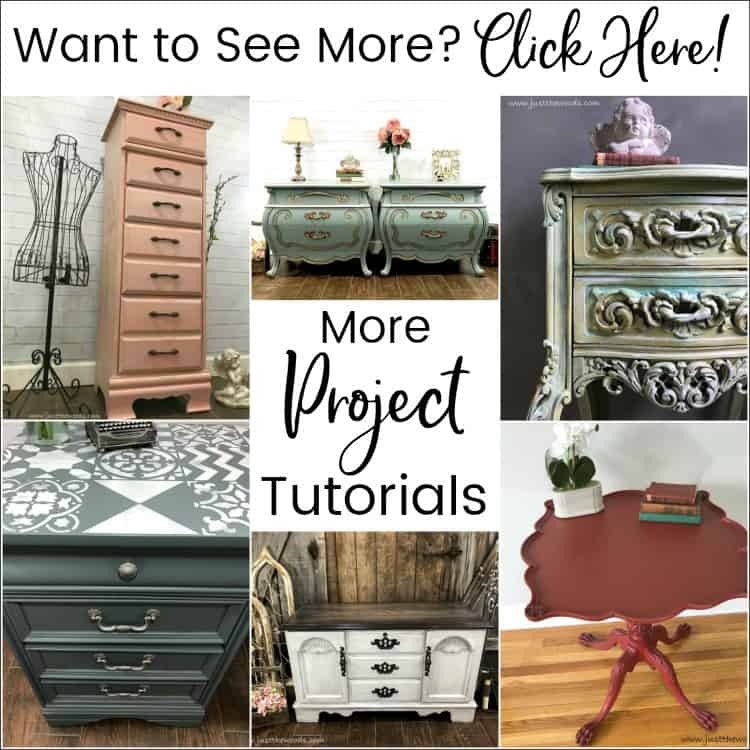 If you love Decoupage projects make sure to check out Fifteen Fabulous Decoupaged Makeovers post: Decoupaged Furniture Makeovers, and if you love gray painted furniture then you don’t want to miss Fifteen Fabulous Gray Painted Furniture Projects post: Gray Painted Furniture Projects. 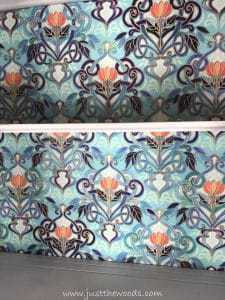 Care to See the Other Projects of the Room Makeover? 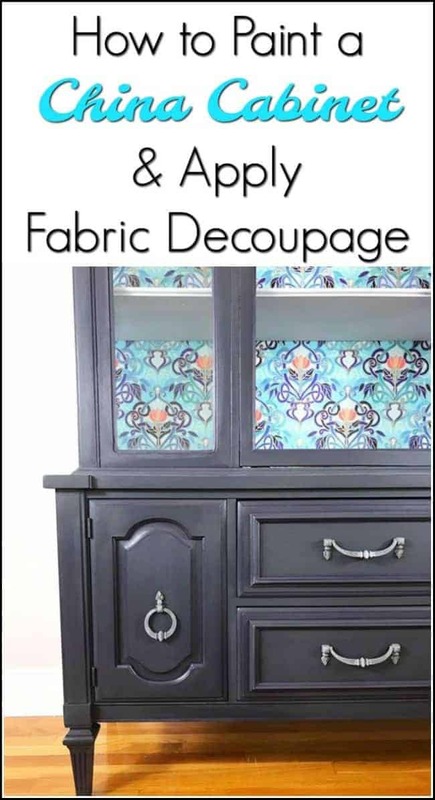 What a great tutorial Kandice, I love the fabric choice and have to head on over to spoonflower for my next project! I adore the purple stain detailing – lends that perfect touch! 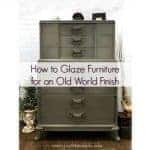 Thanks for sharing at Fridays Furniture Fix! 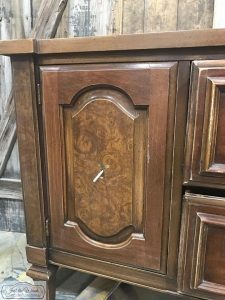 The cabinet looks fantastic. 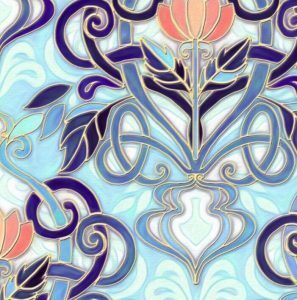 I love the fabric from Spoonflower. Will you still want to put books on the shelves? Looks fabulous! 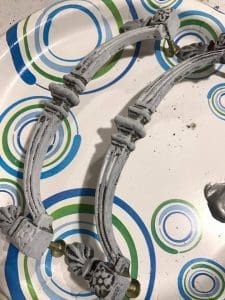 How do you seal your paint? Or do you? I’m floored! 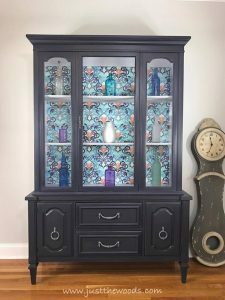 This china cabinet is the EXACT one my grandmother had -EXACT! And it now sits in its original condition in MY dining room. I’ve wanted to redo it, but since it’s such a special piece, I’ve been waiting for the right inspiration and direction… so thank you! This definitely gives me something to consider. 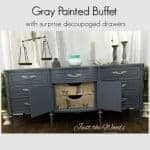 And, I have the matching buffet and the table is in storage… so many ideas!